InCHIP is an independent, multidisciplinary research center at the University of Connecticut dedicated to the creation and dissemination of new scientific knowledge and theoretical frameworks in the areas of health behavior, health behavior change, health intervention and prevention at multiple levels of analysis. Want to have a voice in the future of health research? InCHIP is hosting an Ideas lab this Spring focused broadly on the use of technology to improve health. InCHIP is currently accepting applications (deadline is May 10th, 2019). Click here for more information and to apply. 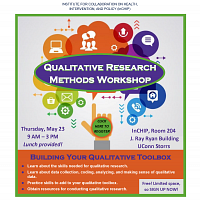 You are invited to RSVP for the Qualitative Research Methods Workshop: Building Your Qualitative Toolbox. The event will take place from 9:00 am to 3:00 pm on Thursday, May 23, 2019. The workshop is free, and lunch will be provided. There is a maximum number of spaces available, so register as soon as possible!